Brighten up winter with the vibrant, exotic flowers and when the blooming period ends, enjoy as an attractive, easy-care foliage plant. Cacti are always an easy care choice that can provide years of enjoyment in the home. Also well-suited to spending warmer months on a sunny patio or deck. Great in containers in a bright window. Can be grown outdoors in warm weather. 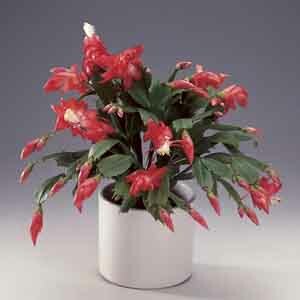 Makes a great gift plant especially for those inexperienced with houseplants. After flowering allow the plant to rest by withholding water for 30 days, then return to normal watering. To encourage reblooming, keep plant in a cool location at 55-60°F (13-16°C) with 8-11 hours of light each day, for 4-6 weeks until the flower buds are fully formed. Once flower buds develop the plant may be moved to desired location. Repot if needed after blooming ends.